These past few weeks have been a whirlwind of wonderful, but can I just say that I am exhausted? After a few weeks of living out of a suitcase, nothing brings me more joy than to write to you all today from the comfort of my desk at home. The world is beautiful with a million and one delicious and exciting things to offer, but like Dorothy said, there’s no place like home. Sometimes I laugh at how attached to this home I’ve become. It wasn’t long ago that the thought of a lifetime spent in the deep Southern confines of Selma, Alabama was terrifying to me. Even to this day, my friends from my pre-Selma days don’t understand how I’ve eased into this life so comfortably. I imagine that the simplicity and slow pace of a small town probably appears lackluster to some outsiders looking in, but I’ve learned that this kind of life can shine pretty vibrantly if you’re willing to settle in and polish it. Are you in a similar phase of life? Have you found yourself in a chapter of your story that you never really imagined for yourself? Are you searching for purpose in a season that you maybe haven’t quite figured out? I want to encourage you by saying that there’s so much hope. There’s silver in the rough edges of our lives if we’re willing to hunt it out, and there’s purpose and joy even in the stories that we wouldn’t have written for ourselves. I have been on the receiving end of so much love and connection and fun- rich relationships and moments that I would have missed out on if I had remained closed to them. 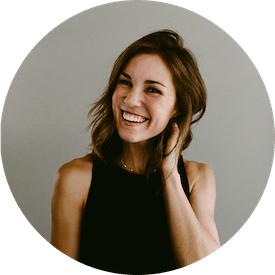 My decision to lean into the unknown and choose joy in the life that we had was one of the most valuable choices I have made, and I hope you’re in a place to make it too. Be at home wherever you find yourself. 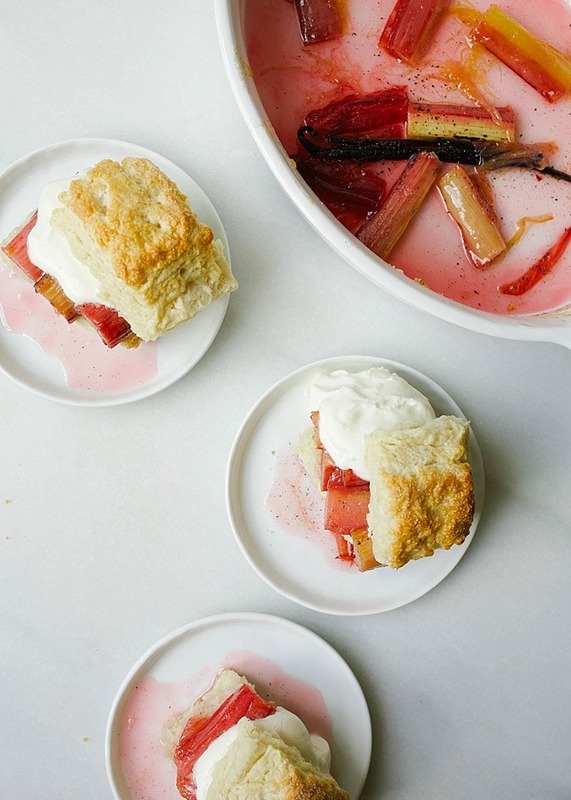 There’s a lot to love about these rhubarb shortcakes. The cakes, tender and layered, make a perfect vehicle for toppings. The rhubarb, roasted until syrupy and sweet, provides a fragrance and tang that not other fruit can. And the mascarpone whipped cream is straight up manna from heaven- creamy, sweet perfection. 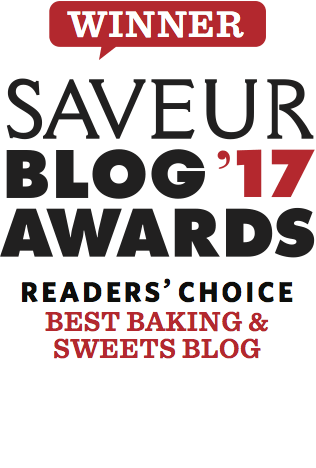 To make these rhubarb shortcakes, we start with the cakes! This recipe was adapted from my jam-filled scones, so expect as much when you make them. Butter is cut into the dry ingredients until there are pea-sized clumps throughout. The heavy whipping cream gets poured in to bring the dough together. We pat out the mixture onto a floured surface and use our biscuit folding technique to achieve tall, flaky layers. Bake the cakes in the oven while you prep the rhubarb. Trim the ends and any rough spots off of your rhubarb stalks and cut them into 2-3″ pieces. Toss them with sugar and fresh split vanilla beans or vanilla bean paste. Roast in a preheated oven until the juices run thick and the rhubarb is tender to a fork. Finally, for the mascarpone cream, beat the mascarpone and sugar together until smooth. Slowly drizzle in the whipping cream until it is incorporated smoothly and beat on medium-high speed until it is cloud-like and fluffy. 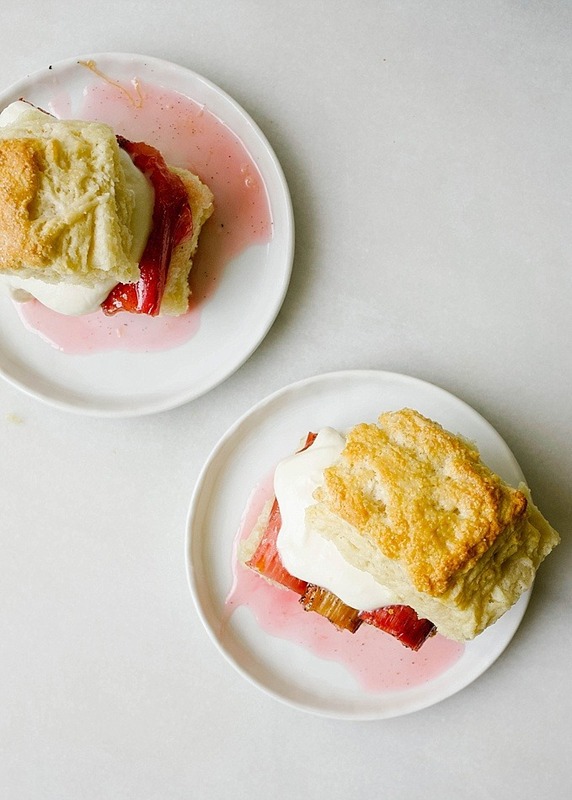 Store in the fridge while you assemble your rhubarb shortcakes. To serve, split the warm cakes in two and top with several rhubarb pieces. Allow the cake to soak of some of the excess juices- SO GOOD. Top with a giant dollop (or two) of the mascarpone whipped cream and replace the lid of the cake. These rhubarb shortcakes are simple and no frills, but entirely impressive to eat. The flavors combine really nicely and make for a delightful summertime treat. Give them a try and I think you’ll agree. If you love them as much as I do, I hope you’ll tell me about it in the comments section below. Happy Thursday and Happy Baking! 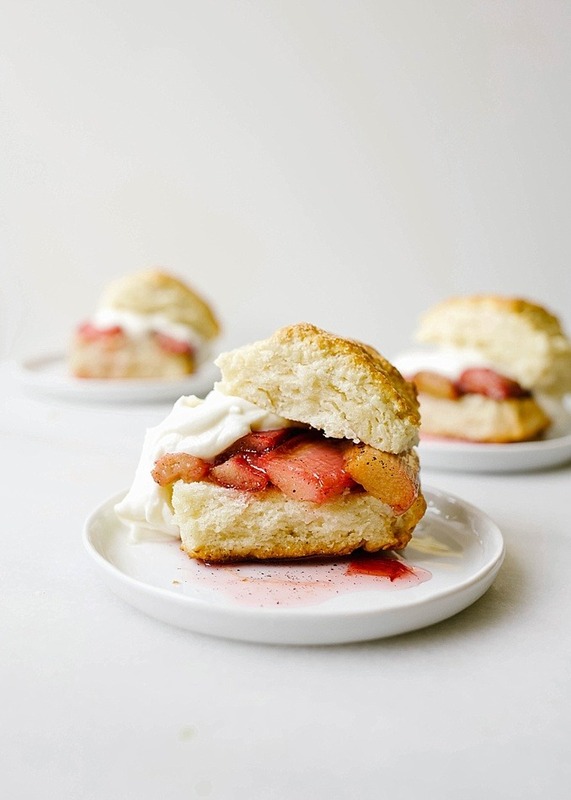 These rhubarb shortcakes are sweet, tangy, and entirely delicious! 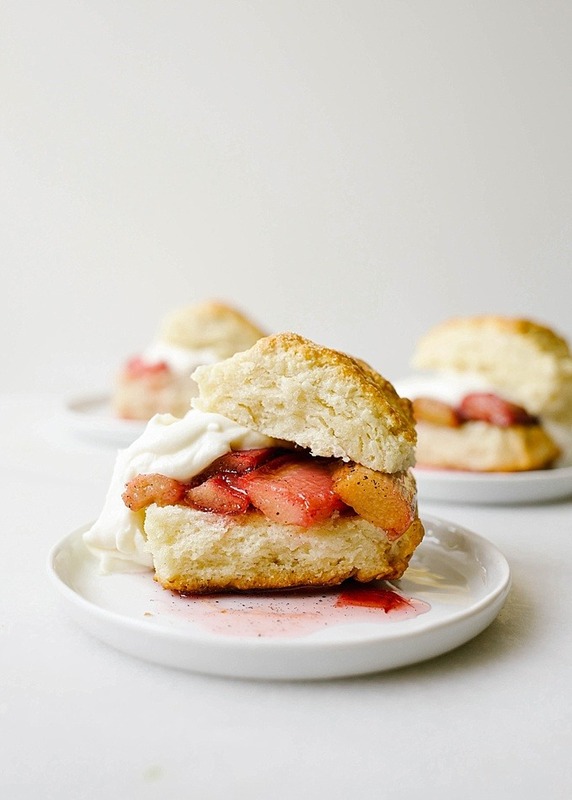 A tender scone is topped with roasted vanilla bean rhubarb and a mascarpone whipped cream. Perfect for summer desserts! Preheat the oven to 425 degrees and line a baking sheet with a piece of parchment. Combine the flour, sugar, baking powder, and salt in a large bowl. Use a pastry cutter or the backs of two forks to cut in the butter until it takes on a sandy consistency with pea-sized clumps throughout. Add the heavy cream and fold until a dough comes together. Pat the dough out into a 1” thick rectangle and then fold in thirds like you’d fold a letter to put into an envelope. Pat the dough out to 1” thickness again and use a knife to cut the dough into 8 equal sized pieces. If desired, you can use a 2-1/2” round biscuit cutter, but this is unnecessary. Place the shortcakes on a baking sheet snuggled up to one another, and use a pastry brush to apply a thin layer of heavy cream on their tops. Sprinkle with sugar, decrease the oven’s heat to 400 degrees and bake the shortcakes until golden brown, about 25 minutes. Allow to cool prior to serving. Preheat the oven to 375 (or lower oven temp after baking shortcakes). 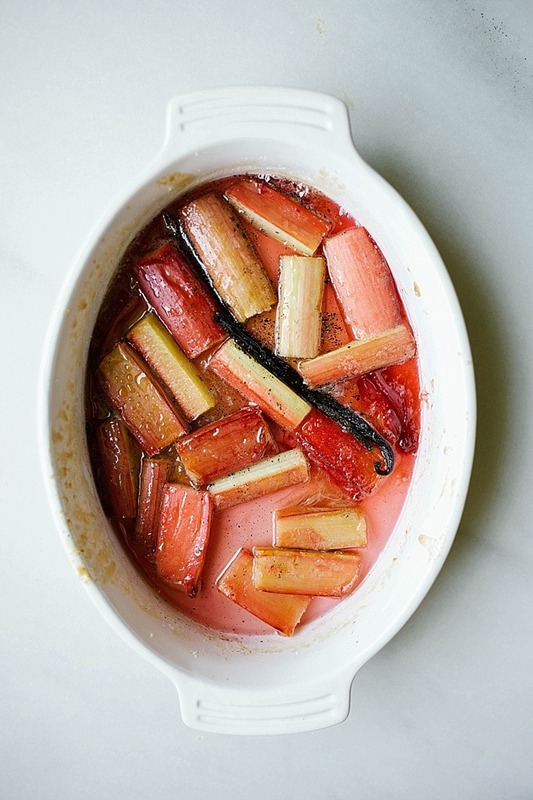 Toss the rhubarb pieces, brown sugar, and vanilla bean paste together in a 9”x13” baking dish. Roast the rhubarb, tossing occasionally, for about 20 minutes or until the rhubarb is tender and the sugar has all dissolved. Allow to cool slightly prior to serving. In a large bowl or the bowl of a stand mixer, beat the mascarpone and powdered sugar until smooth, about 1 minute. Drizzle in a bit of the cream and beat briefly to combine. Repeat this process a few times until the cheese has been thinned out to a loose, smooth consistency. Add the remaining cream and beat on medium-high speed until the cream has fluffed up to a whipped cream consistency and medium-stiff peaks have formed. Split each warm shortcake in half and top each bottom half with a few stalks of roasted rhubarb. Top the rhubarb with a generous dollop of cream and replace the top to the shortcake. Serve immediately! Hey, do you mean by “gm” grams? I think it’s shortened as “g” if not mistaken. Love this short cake. Looking yummy. Can we use white sugar instead of brown sugar for roasted rhubarb preparation. Oh, I hope you will!!! Yummmmm these look so, so good! I hadn’t had a shortcake until we moved here (they aren’t a thing in nz), and the first time I had one I was totally mind blown! Ps your wee town is just the best. Anywhere that serves a ‘rib sandwich’ like that is a winner in my books. I love reading your posts. Like you, I’ve embraced a life I NEVER thought I’d be living, let alone enjoying. As a military (not quite) spouse for the past 5 years, I’ve lived in four states, including a hotel on a Navy base for six months. It comes with its ups and downs, but without the experiences and opportunities we’ve had because of our life, I’ve gotten to do, see and learn so much. Next year will bring another six months in the same hotel again, then a cross country move to the Pacific Northwest. Thanks for always sharing so honestly! Have a great Memorial Day weekend!